Hugo first visited The Vet in July 2015 for his puppy vaccinations and won the hearts of our whole team, however in November, Hugo seemed to be struggling to use his back leg. 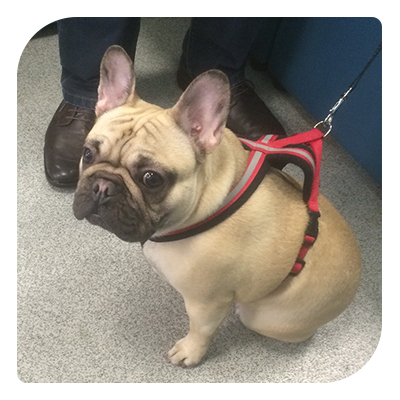 Worried, Hugo’s owner brought him in to see our Veterinary Surgeon, Jessica. She examined Hugo and found he had a luxating patella in his right hind leg. (A luxating patella is when the knee dislocates, meaning the knee cannot fully extend) After studying the x-rays, Jessica felt happy that Hugo would benefit from surgery to have his knee realigned. Two days after his surgery Hugo came in for his post-operative check and was healing well. He started walking with no signs of lameness and was given the go-ahead to resume going for walks again, starting with ten minutes at a time on the lead. A few weeks later, Hugo’s owner was concerned and informed us that he appeared uncomfortable, limping and lifting his leg again. During his check-up, Jessica concluded that the operation was successful however it appeared that he was having a small allergic reaction to his stitches. Hugo was already booked in for an entropion procedure (a surgery which corrects a genetic condition where part of the eyelid is folded inwards) which gave Jessica time to remove the stitches from his knee whilst he was still under anaesthetic. Hugo was then prescribed to have an injection every week for four weeks to help keep him comfortable. In February the team were happy to see Hugo was doing very well, the antibiotics had worked their magic however he had a slightly swollen knee and the team had to remove 3mls of fluid from the area. Hugo’s owners were told they could increase his exercise but to limit his jumping or chasing of his favourite ball. Hugo has been recovering well from both surgeries and to the pleasure of the team, comes in frequently for further check-ups. Hugo will soon be able to go back to chasing his ball in no time!